Since then I’ve come back for every 4,000 mile service. I’ve also done the brake service class, where I upgraded my brake line from the ancient rubber line to stainless steel. The three hours it takes me to do the service with a brake bleed comes to $65 plus the cost of the new parts and oil. It’s a huge bargain considering what I was paying to take the bike to a shop! I’ve also come back with my track bike for more or less the same set of maintenance items and upgrades. The Nighthawk back in the shop just last month, featuring more lens flare than a Michael Bay film. According to the 2010 census, 43.8% of housing units in the Bay Area are occupied by renters (such as myself, being fresh out of college). That number has almost certainly gone up since then, and many of us would have no better place to do maintenance than a carport or in the street. Even homeowners with an enclosed garage are unlikely to own the vast array of tools made available by Moto Guild (the lifts alone are worth the cost of entry!). That’s not to mention the classes, guidance, gear consignment and any assistance acquiring parts that the shop provides. The shop is remaining open until August 31st with its usual assortment of classes. Ideally, a buyer will come forward and purchase the business to keep it operating. As far as I can tell, the Chicago and Philly locations have closed down, potentially leaving only the Silicon Valley location in San Jose. It’s a bit of a hike from Oakland, but it’ll be worth it if the Treasure Island location does shut its doors. I’ll be taking the tire change workshop next. My current set of mismatched Dunlops are getting a little long in the tooth, and I’ve heard good things about the Bridgestone Battlax BT45’s. After that I’m due for a new chain and sprockets, and then I think it’s about time I do the suspension rebuild I’ve been talking about for the past year. The great thing about Moto Guild is that it’s something that any motorcyclist can benefit from. No job is too large or too small. Stopping by during your commute across the bridge for some air in your tires? There’s a compressor and a pressure gauge right by the entrance. Got in over your head with a “ran great when parked” project bike you want to turn into café racer? Professional guidance and long term storage are both available. 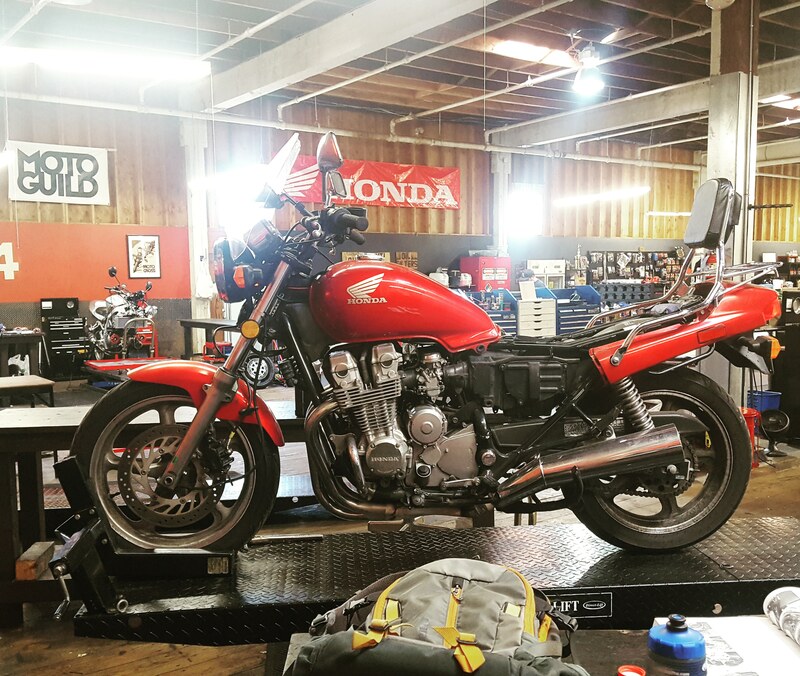 Motorcyclists of all experience levels can find something useful there, whether you’re a novice taking the oil change workshop or a seasoned DIY mechanic who just needs a bike lift. Moto Guild really is an invaluable resource, and it would be a huge loss if it shut its doors for good. To Aleks, Wilder, and Tracker the Shop Dog, best of luck in your next venture! Move forward knowing that you’ve had a positive impact on motorcyclists around the Bay. Thanks for giving the Bay Area riding community a perfect environment to wrench, and us younger members the confidence to do it! Maybe Keanu Reeves will take the shop under his wing? Anyone have his number?